Computer and Video Games (CVG), which in 1981 was the world's first magazine dedicated to gaming, is facing closure. The title, which has been online-only since 2004, may stop publishing at the end of a 45-day consultation period that began on 14 May, sources said. However, its publishers Future are also believed to be looking into selling off the brand. The magazine is behind the gaming industry's Golden Joystick Awards, a yearly event held since 1983. In a statement, Future said: "We are currently exploring various options around how to evolve the CVG brand in particular and the market leading Future Games portfolio in general, in order to keep successfully meeting the needs of our consumers." The first issue, published in November 1981, billed itself as the "first fun computer magazine" and cost 75p. 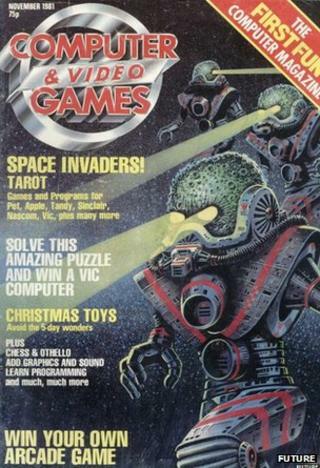 Its cover story was about Space Invaders, while a competition gave readers the chance to win a Vic computer, an 8-bit home computer made by Commodore. The monthly magazine stopped publishing in 2004, with the focus turning to its website which had been up-and-running since 1999. In 2008, Future re-launched the printed magazine as a bi-monthly title, but it stopped publishing in 2009. As well as CVG, Future also owns other prominent gaming brands, including GamesRadar and PC Gamer. Future recently launched a separate games website, Kotaku UK - a localised version of the already established Kotaku gaming news site owned by US firm Gawker Media. Veteran games journalist Rik Henderson, from Pocket-Lint, said if CVG is closed it will be missed by many. "Everything in video gaming changed when CVG first hit the shelves," the former GamesMaster presenter said. "Everything else around that time was either a dedicated machine-specific magazine, or there were small games sections in general computing magazines. "There was nothing really saying 'look at this world of gaming'." Early issues of the magazine were seen as being instrumental in helping small-time games developers to get their titles out there, said Mr Henderson - a trend that he thought was beginning to re-emerge as apps and mobile gaming have taken off. But he argued that in a global, online publishing market, the brand's strength did not extend far enough. "Something had to give," he said. "Future have quite a portfolio of games websites, but everyone's fighting for a very small pot of advertising. "CVG does really well - but it just didn't fit in that portfolio."